For this blog post, I really was not sure what I would write about. I had one idea in the back of my head that I thought would be a good paper topic, but I did not think it necessarily fit in with the blog post. Then I remembered the flexibility that these blog posts entail. The first successful policy or campaign that came into my head was the No Texting and Driving campaign. I’m sure and I hope that you have been educated in some way of the dangers associated with texting while driving. The campaigns that are out there are very effective at “scaring” people by showing real examples of the loss that is associated with texting while driving. In my opinion these campaigns are incredibly effective. The campaigns aimed largely at young ignorant drivers who think “this will never happen to me.” The campaigns images and stories hit close to home. They show actual victims that were killed or injured in accidents while texting. It really changes peoples behaviors as they are more hesitant to reach for that vibrating text. 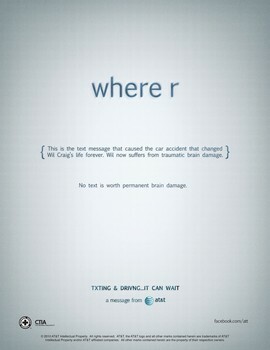 The campaign shows how avoidable the accidents can be and how unimportant a text message while driving is. I think that dont text and drive campaigns have had a major impact on the amount of people that text. The campaigns and the additional laws prohibiting phone use well driving are extremely successful and only help people. They are non-profit and help save lives. Teaser Alert: Dodd-Frank!..What a JOKE!